ORIENTAL RUGS AS ART Rugs are art, and they also happen to be useful as floor covering. Buy an oriental rug because you appreciate its art, using the same criteria that you would use to buy a painting. Do not buy an oriental rug just to match your decor, lest the rug outlast the decor and you will be stuck with a decorative white elephant. Colors and fashion change but fine art, fine jewelry, and fine rugs are always in style. The name or type by which an oriental rug is sold tells little about where the rug was woven, how old it is, or its quality. Tabriz…Heriz, Kerman…Kashan, Beluchi…Serapi, Bokhara…Bergama–none of these names define quality. They are names that throughout history have been associated with rug weaving, either geographically or commercially, but these terms are not specifically defined through oriental rug weaving. 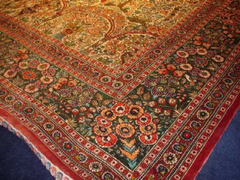 Rug dealers have attached them to their products to legitimize their claims about their rugs; but, the names are irrelevant to the value of the rugs, unless they are accompanied by information, such as knot count, pile fiber, condition, etc., which defines the quality of the specific rug in question. COMMONLY — USED DESIGN NAMES The names associated with oriental rugs are more suited to describing rug design than rug quality. We acknowledge that agreement on definitions for oriental rug design names is elusive. The following definitions are necessarily brief. War rug. Depiction of weapons or military activity.